Our brand new 120 passenger ship is built to take you closer to unspoilt vistas in comfort, style and safety. 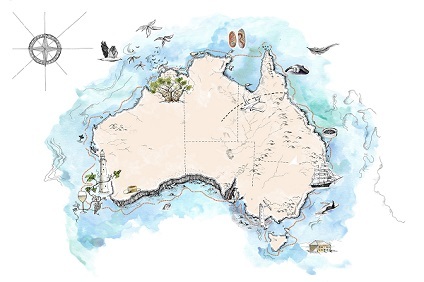 A culmination of two years of design and three decades of passion for expedition cruising – Coral Expeditions is proud to invite you to experience the Coral Adventurer. When we set out to build the Coral Adventurer, we wanted a ship that would last decades. The search for build quality and technology took us to the shipbuilders of Norway who have a long history of building durable ships for the harsh environments of the North Sea. We then looked deep inside to capture the requirements of our guests, our crew and the areas we sail to. The result is a happy marriage of modern shipbuilding technology and cruising Australian style. > Curated wine cellar featuring modestly priced boutique wines for daily drinking and exceptional vintage Australian reds. Bathrooms on board Coral Adventurer are equipped with both 110V and 200/240V outllets for electric shavers only. 10 Night cruise departing roundtrip from Darwin onboard Coral Adventurer. 10 Night Cruise sailing from Darwin to Broome aboard Coral Adventurer. 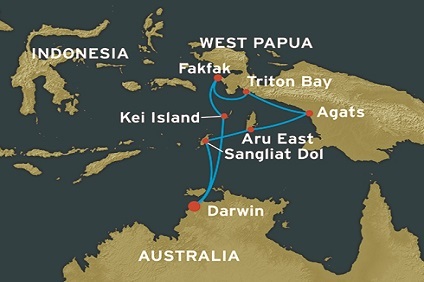 10 Night Cruise sailing from Broome to Darwin aboard Coral Adventurer. 22 Night Cruise sailing from Darwin to Cairns aboard Coral Adventurer. 12 Night Cruise sailing from Darwin to Vanimo aboard Coral Adventurer. 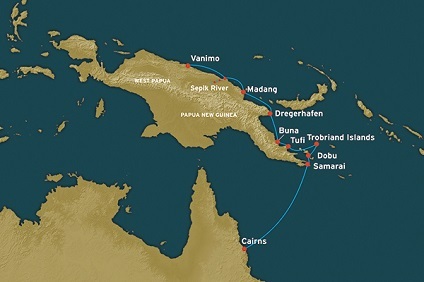 10 Night Cruise sailing from Vanimo to Cairns aboard Coral Adventurer. 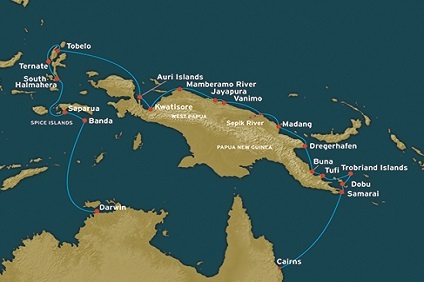 12 Night cruise departing from Cairns to Madang onboard Coral Adventurer. 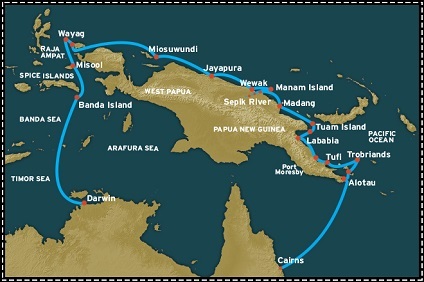 12 Night cruise departing roundtrip from Cairns (including a charter flight to Madang) onboard Coral Adventurer. 25 Night cruise departing from Cairns to Darwin onboard Coral Adventurer. 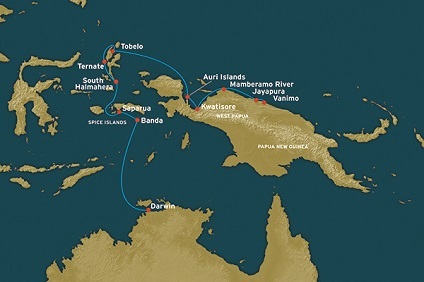 12 Night Cruise sailing from Cairns to Wewak aboard Coral Adventurer. 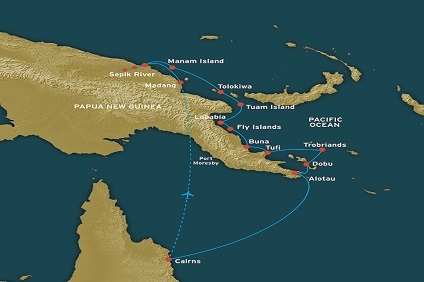 13 Night cruise departing from Wewak to Darwin onboard Coral Adventurer. 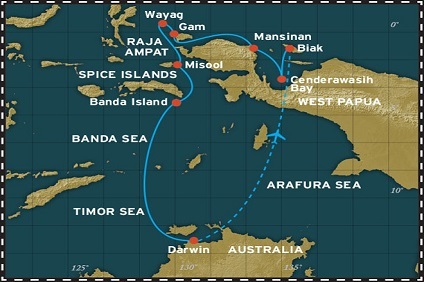 11 Night Spice Islands & Raja Ampat cruise departing from Darwin to Biak onboard Coral Adventurer. 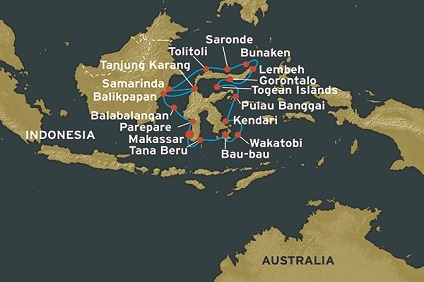 12 Night Spice Islands & Raja Ampat cruise departing from Biak to Darwin onboard Coral Adventurer. 17 Night cruise departing from Darwin to Singapore onboard Carol Adventurer. 18 Night Cruise sailing from Singapore to Darwin aboard Coral Adventurer. 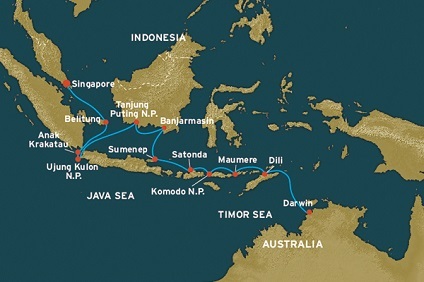 14 Night Cruise sailing from Darwin to Makassar aboard Coral Adventurer. Hotel stay pre-cruise in Darwin. 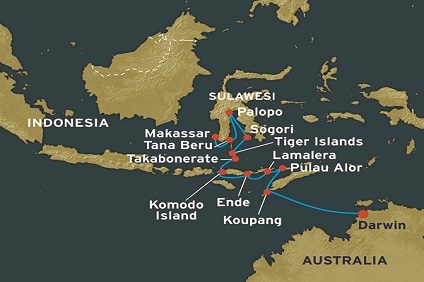 20 Night Cruise sailing from Makassar roundtrip aboard Coral Adventurer. Hotel stay pre-cruise in Darwin. 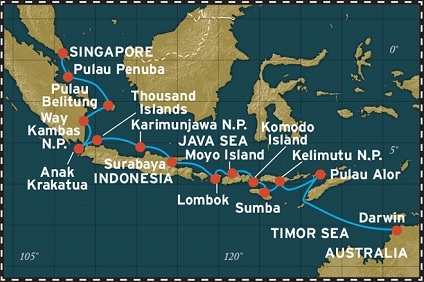 14 Night Cruise sailing from Makassar to Darwin aboard Coral Adventurer. Hotel stay pre-cruise in Darwin. 59 Night Cruise sailing from Darwin roundtrip aboard Coral Adventurer. The two Cairns and Darwin suites are spacious and elegant retreats after a busy day ashore. Suites are equipped with a lounge area, minibar and personal coffee machine. They have special King sized beds which can be separated into two singles. An 8 sq m private balcony has an outdoor daybed and lounge chair for two. A unique outside-facing bathroom with picture windows, bath and separate shower complete the suite experience. A complimentary minibar is replenished daily. The two Bridge Deck staterooms are comfortably furnished with a junior King size bed which can be separated into two singles. A wardrobe, desk and arm chair are included. A compact en-suite has a toilet, shower and ample storage. French windows opening to a balcony with seating for two gives you a private perch to watch the panorama unfold outside. These staterooms are located on the bridge deck with superb views and adjacent to the Cairns and Darwin suites. 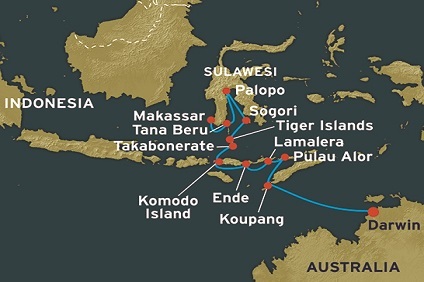 Explorer Deck staterooms are comfortably furnished with a junior King size bed which can be separated into two singles. A wardrobe, desk and arm chair are included. A compact en-suite has a toilet, shower and ample storage. Your private balcony has seating for two from which to view the passing coastal vistas. These staterooms are located on the Explorer deck. Promenade Deck Staterooms are located below the Explorer deck and furnished with a junior King size bed which can be separated into two singles. A wardrobe, desk and arm chair are included. A compact en-suite has a toilet, shower and ample storage. A large picture window gives you wide views of the world outside. Coral Deck Staterooms are identical to the Promenade Deck Staterooms except for their location one deck below. These staterooms have twin portholes rather than picture windows.